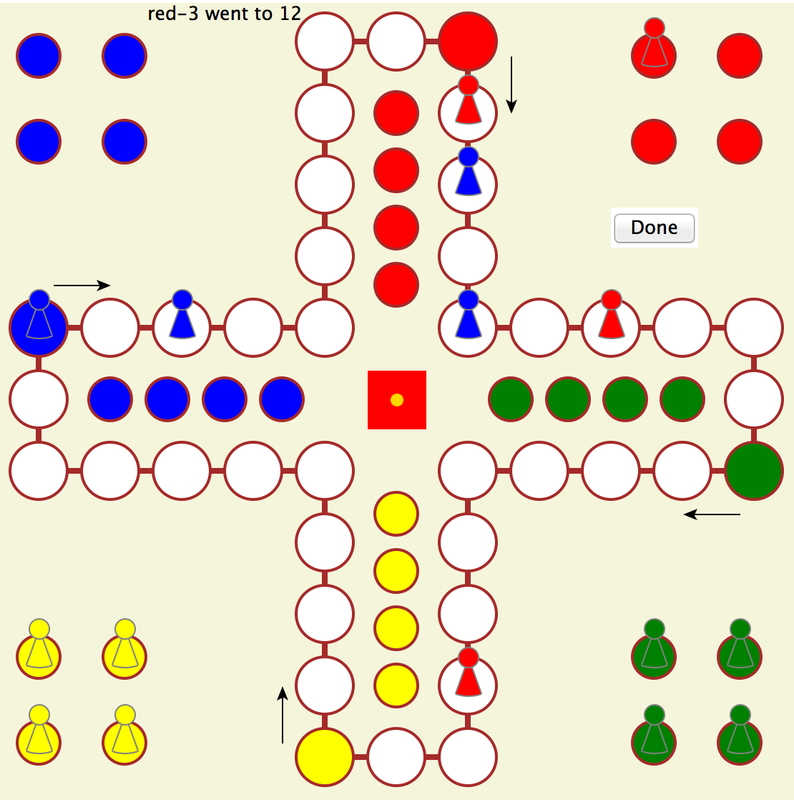 A small Ludo/Mensch ärgere Dich nicht/Pachisie game, originally developed by Richard Suchenwirth in plain Tcl (see http://wiki.tcl.tk/956). The game was rewritten as a design study in NX by Gustaf Neumann in July 2013. The active player (marked with the button) has to dice (click on the die, or press somewhere on the board "d"). If all figures are in the nest (start position), the player needs to dice a 6. The player is allowed to try three times, then the player is done (press "done" button, or type "n") and the turn moves to the next player. When a player got 6 eyes, he can move out of the nest. This is done by clicking on the figure the player wants to move. After dicing 6, the player can dice again and move the player on the field (always by clicking on the figure). Define an application specific converter "expr" that passes the scalar result of the expression. Since the converter is defined on nx::Slot, it is applicable to all method and configure arguments. # Start moving the figure if the draw is permitted. # The board knows the die and the rules. # moves stepwise from position to position. # could be made faster, but is efficient enough as it is. # Set the eyes of the die. # Invalidate the eyes to avoid double uses of the eyes. # Report a message to the user. # through the opponent out. # On player can't have two figure at the same place. # position in the opponents nest and though her out. :msg "[$obj cget -color]-[$obj cget -no] went to $pos"
# figure, which might be in the nest or on the run. # Check, if the actual figure is at the start position. # Switch to the next player.